Simple to make, thick and creamy, peaches and cream milkshake made with wholesome vegan ingredients. This is the perfect breakfast to keep you full and satisfied for hours, plus it’s absolutely delicious! Every morning I eat about 4-6 pieces of fruit as my “pre-breakfast”, then when I need something a bit more filling I turn to my milkshakes. I leave to go see clients around 10am and don’t get back till around 1-2pm, so I need something that is going to keep me satisfied until I get home and eat lunch. These milkshakes do an incredible job at keeping me full until then, because they are filled with nuts and seeds that are slower to digest, full of protein, and packed with nutrients. To prep for my milkshakes each week I cut up some leftover fruit from the previous farmers market and put it in the freezer. My go to milkshakes were usually made with bananas, but since peaches and nectarines are fully in season, I decided to forgo the bananas and try something new. Peaches and cream is an excellent combination, and the peaches are a great substitute for creamy bananas. 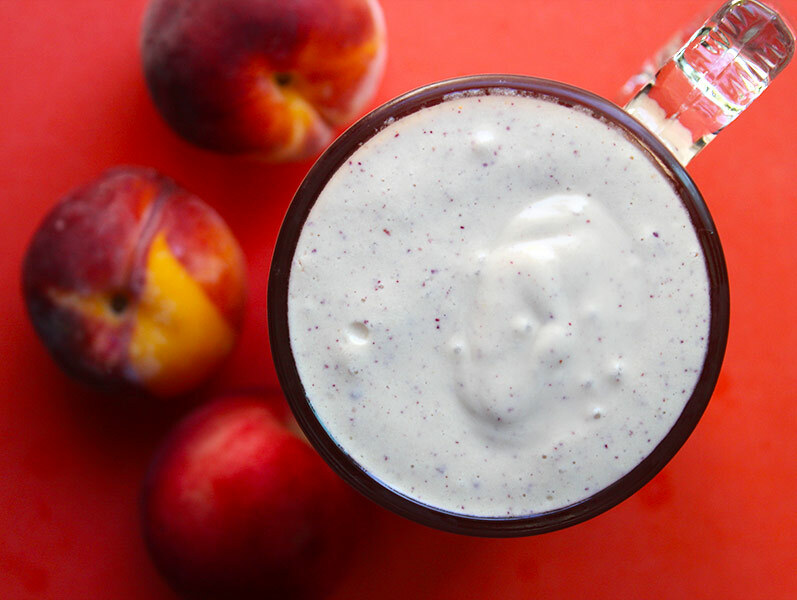 When you’re ready for your milkshake, all you have to do is blend together cashews, non-dairy milk such as flax milk, frozen peaches, a little maple syrup and some water. That’s it, a delicious filling breakfast in less than 5 minutes. To make this a completely raw vegan milkshake, skip the maple syrup and add 1-2 dates instead. To add even more satiating elements, you can add a teaspoon of chia seeds, or flax seeds, and for a boost of energy try adding a teaspoon of maca root powder. There are many little “superfoods” you can add to milkshakes to pack in extra benefits. I wish I had known how to make these when I was in school because I always found myself extremely hungry shortly after eating the traditional cereal, bagel, pop-tarts, or one of those nasty frozen egg sandwiches. You live and you learn. Blend all the ingredients together in a high speed blender until smooth. Flax milk can be substituted with your favorite non-dairy milk. Maple syrup can be substituted with 1-2 dates to make raw vegan. 1 tbsp chia seeds or flax seed can be added to keep you extra full. 1 tsp maca powder can be used to boost energy.